From the positions of the fullerene nature of liquid cast iron, the author has analyzed the effect of the surface-active elements of subgroups Va and VIa of the periodic table on the processes of cast iron inoculation and crystallization. It has been shown that liquid cast iron is a single-phase system presenting a carbon-ferriferous polymer whose basic structural elements include fullerenes and carbon nanoparticles based thereon. A structurally scaled organization of iron-carbon melt has been developed and a new classification of inoculation processes has been proposed. Based on the investigations carried out, a process of iron melt nanoinoculation has been developed. Peculiarities of hydrogen's behavior in making high-purity Cr-Ni-Mo-V steel have been investigated, and measures contributing to the reduction of its silver spot susceptibility have been proposed. Absence of relationship between hydrogen concentration and metal's contamination with sulfides and nonferrous impurities has been established, due to high chemical and metallographic purity of the metal produced. It has been shown that one of the reserves for reducing the silver spot susceptibility of such steel is the provision of certain ratios of alloying elements within a narrowed range of their content in the steel grade, and the change of morphology of nonmetallic inclusions, in particular, nondeformable silicates. A thermokinetic investigation into the process of crystallization of low-alloy gray cast iron and high-strength cast iron with different silicon contents in massive castings at different cooling conditions has been conducted. Kinetic diagrams of the cast irons' crystallization have been plotted. Several structural effects have been revealed, in particular, thermokinetic conditions of reverse chill formation have been determined. Chemical compositions of cementite in the surface and central zones of the casting have been experimentally determined. Proposed is an explanation of the reverse chill mechanism, related to nonequilibrium crystallization of cast iron and its effect on the interphase distribution of elements being a consequence of the interaction of thermodynamic and kinetic factors. Analysis of results of work of a number of researchers done by various methods on partial disintegration of binary metal melts occurring in crucibles as a result of action of gravity or centrifugal forces is given. Based on the analysis of the experimental results it has been concluded that in the liquid there exists a superfluid component that shows in experiments with binary melts due to different mobility of alloy components. This assumption allows excluding contradictions in explaining the results. The effect can find application for the processes of separating and refining of metal alloys, and in creating structural elements with a composition variable in the chosen direction. Results of research of influence carbide-forming elements (Cr, W, Mo, V, Mn) on density, electro- and heat conductivity, hardness and microhardness of structural components low-carbon white cast iron are resulted. At alloying of cast iron W, Cr, Mo hardness and wear resistance change on extreme dependence. Between hardness and wear resistance there is a direct correlation. The density of cast iron increases in process of increase in concentration W up to 15%, Мо up to 3,0%. Alloying of cast iron Cr, Mn and V promotes reduction of density, in most cases alloying of cast iron promotes reduction heat conductivity and electroconductivity. Complex character of change electroconductivity and heat conductivity from the contents of chrome is connected with inversion of chromic carbide phases. Discussed is a combined treatment of grade AK7ch aluminum alloy with high-temperature overheating and manganese chloride and zinc chloride. It has been shown that the technology favors the enhancement, as compared to a raw alloy, of the complex of mechanical properties, castability, the melt's purity from nonmetallic inclusions. An increased amount of low-grade materials can be used as charge. Fire and explosion safety of the process of crushing and screening ФСМг5 inoculant has been assessed for the purpose of producing a powder with a particle size of 0.6 to 8.0 mm under the conditions of the foundry of an automobile plant. The explosion-fire and fire hazard related room category has been determined proceeding from dust accumulation dynamics and manufacturing equipment capacity, taking into account the periodicity of removing deposited dust under the conditions of operating aspiration. Importance of ensuring fire and explosion safety at machine-building plants during crushing and screening of inoculant for the needs of the foundry is shown. Dust accumulation dynamics have been ascertained as one of the main factors in determining the explosion and fire hazard related room category. 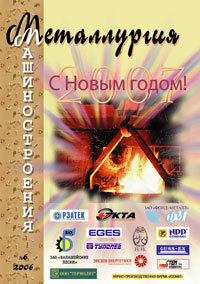 Review to monograph "Domain Pig-Iron Metal of the Future"
Books of Publishing House "Mechanical Engineering"